As the eye falls upon desirable material objects, the mind enters into a haptic process of touching the form from a distance, becoming a willing participant in the process of seduction. Shyra de Souza's work is focused on the challenge of creating both a critical distance for the viewer of discarded, mass- produced objects she uses in the work, while simultaneously drawing from, and building upon the extreme sensuality and allure of these objects. The intent is to remove the viewer from metaphorical and representational systems of thinking. She integrates multiple closed forms (usually second-hand, contemporary home décor items) into larger, open, layered, configurations. She places the resulting forms within a theatrical context that prompts a self-guided process of meaning- making in the viewer. The somewhat uncanny sensation of these reconfigured, less representational forms is intended to generate a sense of suspicion or disbelief of the form’s representational power. In accomplishing these artistic goals, the viewer becomes a mandatory part of the work in that the actual artwork occurs where the art object and viewer intersect. Her central method is that of collapsing reverence for these objects by indulging in them, heightening their effect. 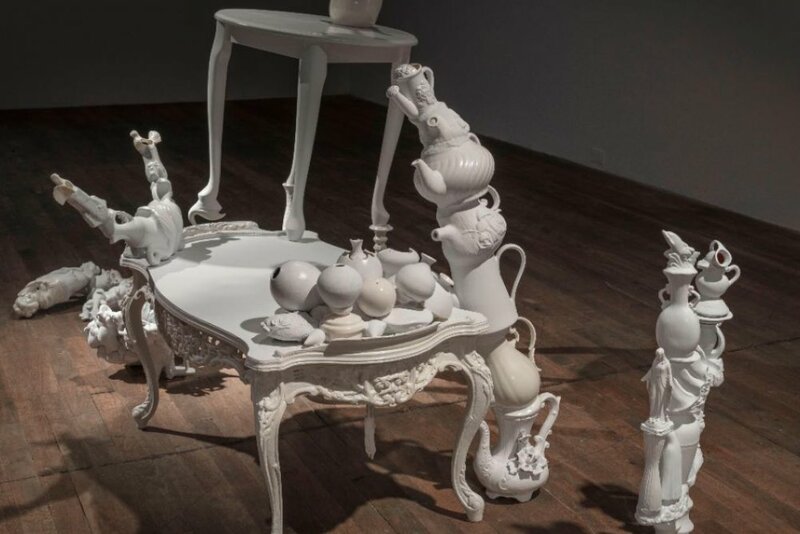 She personally experiences their seductive characteristics, as she undertakes an organic, adductive/reductive process in order to rearrange the objects into highly provocative forms. The resulting work accesses a form of visual communication akin to pseudoscience, mysticism, mythology, and other psychological phenomena. she wishs to trigger a sort of cognitive equilibrium in the viewer where belief and non-belief are forever suspended.